Heilige Geeststraat 1, 8000 Brügge, Belgien. Romantically dreaming away...... Check out the beautiful city of Bruges together with Hotel De Castillion ! 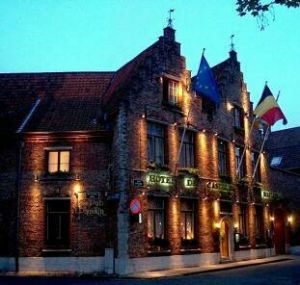 The elegant Hotel De Castillion is located at the very heart of the historic city of Bruges. You will fancy yourself in an 18th century mansion during your stay. This image is evoked by the magnificent building that has been fitted up to meet contemporary demands with a unique sense of style. Hotel De Castillion is not only a home away from home for the travelling businessman in Bruges who is looking for serene tranquillity, but also an excellent starting-point for those who seek to scout the historic and cultural city of Bruges, the city of well-known museums, picturesque canals, wonderful shops, etc... A charming and comfortable hotel with twenty rooms. Apart from the ever present ingredients that make this hotel so special, you will be pampered with a sincerely warm welcome, an excellent service and personal attention duting your stay in Bruges. All in all an experience that should not go unnoted. At night you can endlessly enjoy an excellent dinner served in the pleasant ambiance of Restaurant "Le Manoir Quatre Saisons". After dinner you may feel like lounging in the authentic art-deco salon or nurse a night-cap in our intimate bar. Hotel De Castillion : the best gift to surprise anyone! 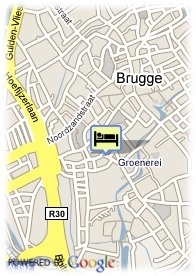 We would be thrilled to welcome you in Bruges one of these days ! kostenpflichtiger Parkplatz, Bezahltes open air Parkplätze beim Hotel (20.00 €), Reservierung erforderlich. Mehr als 7 Tage vor Anreise : keine Annulierungkosten. Weniger als 3 Tag(e) vor Anreise : die vollständige Reservierung zu zahlen. ältere Kinder und Erwachsene: 25.00 € pro zusätzliches Bett. Babybett: 12.00 € pro zusätzliches Bett. Restaurant 'Le Manoir Quatre Saisons' - Executive Chef Olivier Christiaens. Contemporary and traditional cuisine : the continuous rejuvenescense of traditions, the overlasting quest for perfection, top quality and seasonal produce. You can endlessly enjoy an excellent dinner served in the pleasant ambiance of Restaurant 'Le Manoir Quatre Saisons'. Menu 'Seasonal Pleasures' : to experience a special moment. Chef Olivier Christiaens' telents expressed in six creations. Balance and harmony on the plate, intuition, spontaneity. Hotel De Castillion is located in the very heart of the historic city of Bruges, in the shadow of the Saint-Salvators Cathedral.